Richard Sala is a creator of beautifully gothic comics and cartoons (you may remember his “Invisible Hands” cartoon from MTV’s Liquid Television). Often compared with Edward Gorey and Charles Addams, his style is at once charming, eerie and sensual. He’s equally comfortable drawing vampires, ghouls and hunchbacked grotesqueries as he is pretty barefoot girls (heroine Peculia never wears shoes, as with most females in Sala’s work. Whether it’s a metaphor or a fetishistic preference is anyone’s guess). He’s one of a handful of cartoonists whose style seems effortless in its intricacies. But maybe more importantly, his work is a joy to read. His new graphic novel, Peculia and the Groon Grove Vampires (actually the 13th issue of his Fantagraphics comic book, Evil Eye) probably took Sala about five minutes to write, and it’s nothing earth shattering, story-wise. It’s a simple, predictable vampire fairy-tale. You could read the entire thing in about five minutes, but don’t. Take your time, languish in the texture and the mood of the book, feel the slight tinge of guilt over the prurience involving a gaggle of teenage babysitters, taken one by one by the vampire family. It’s unusual that a creator’s latest work is a good starting point for the uninitiated, but that’s the case here. 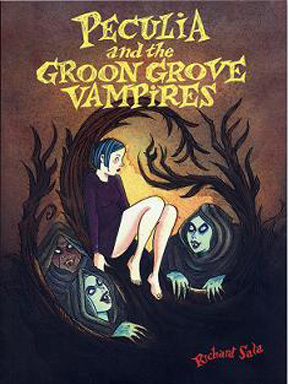 Peculia and the Groon Grove Vampires is the perfect introduction to Sala’s work (and it’s my favorite graphic novel format, the smaller 8 x 6” size). Odds are you won’t stop there.